A dark, rich, moist and robust yet subtle vegan banana bread that pairs nicely with a steamy cup of coffee. Adding a little coffee to the recipe helps bring out the flavor of the bananas. 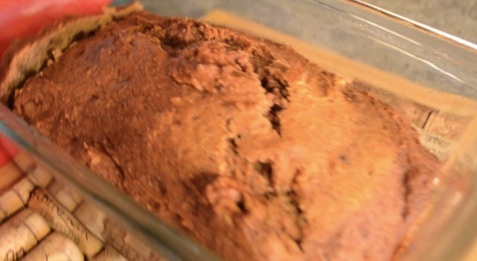 Instead of egg we are using flax seed meal, we did the same for our Pumpkin Bread. I use oil in the video, but subsituting 1/2 cup of non-fat plain or vanilla yogurt in makes it more moist and lower in fat but no longer vegan. I had suggestions of chocolate chips, carob chips, and peanut butter too!! Share your suggestions of favorite things inside or on top of your banana bread by commenting below. Preheat the oven to 350 degrees F. Spray the bottom of a loaf pan with nonstick cooking spray. Whisk or blend the flax water and coffee until frothy. Mix the mashed bananas, olive oil (yogurt/apple sauce), flax and molasses. Mix the dry ingredients - flour, sugar, spices, salt, and baking soda. Pour the batter into prepared loaf pan. Bake for 55-60 minutes. After 50 minutes check with knife or toothpick by sticking it in the bread. If it comes out clean ~ its done. If it has some batter on it, cook a little longer. If it still needs to cook longer but is already quite browned, place foil over the top to stop it from browning.